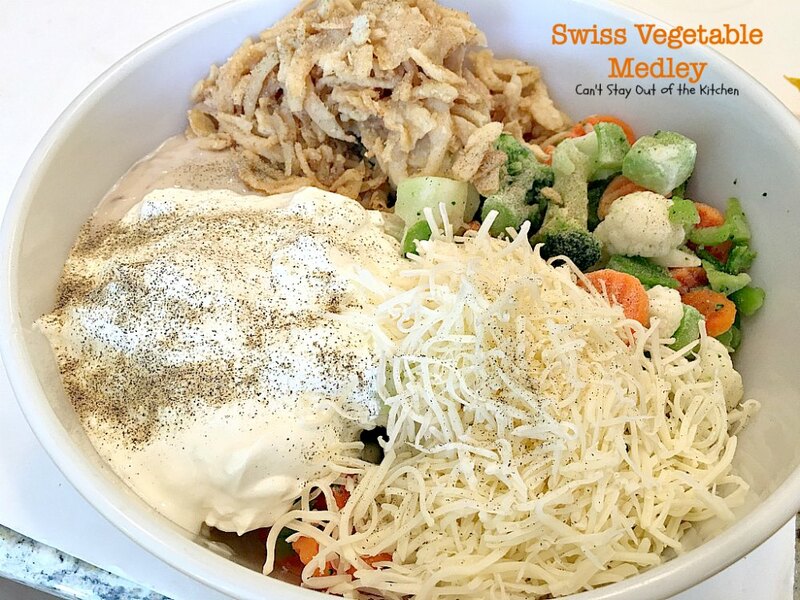 Swiss Vegetable Medley is a great side dish. You start with any kind of mixed vegetable medley you enjoy. Then you add a sauce composed of cream of mushroom soup, sour cream, French-fried onions and Swiss cheese. You top the casserole after baking with more swiss cheese and French-fried onions. It has superb flavor and texture. I doubled the vegetables because in the original recipe the sauce was too overwhelming for the small amount included. The additional vegetables make this dish so much better. 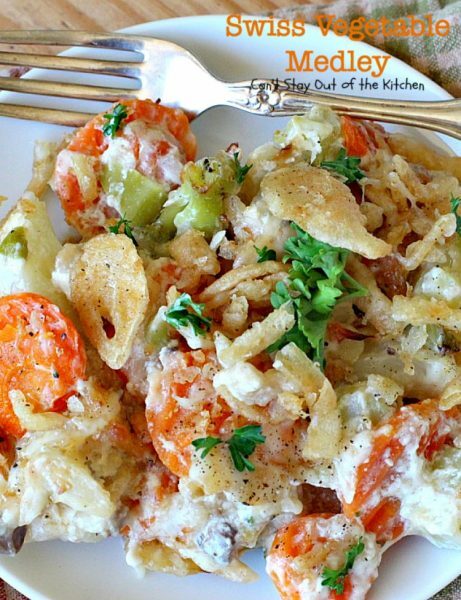 This is a wonderful casserole for holidays and company, especially when you see how easy and quick this recipe is to prepare. 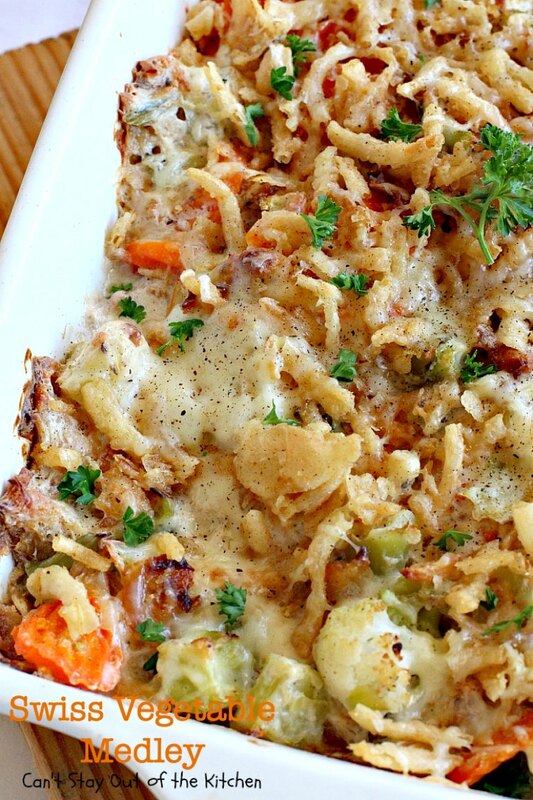 You’re basically just stirring everything together and letting it bake in the oven. No cutting or chopping, not a lot of steps–just very basic. But it’s not basic in taste! It’s comfort food at its finest. I found this recipe on the Internet probably at allrecipes.com but it is actually a French’s recipe originally. Taste of Home and Food Network also have variations. I made this the other day for company where I doubled the vegetables which made Swiss Vegetable Medley a little more mellow. 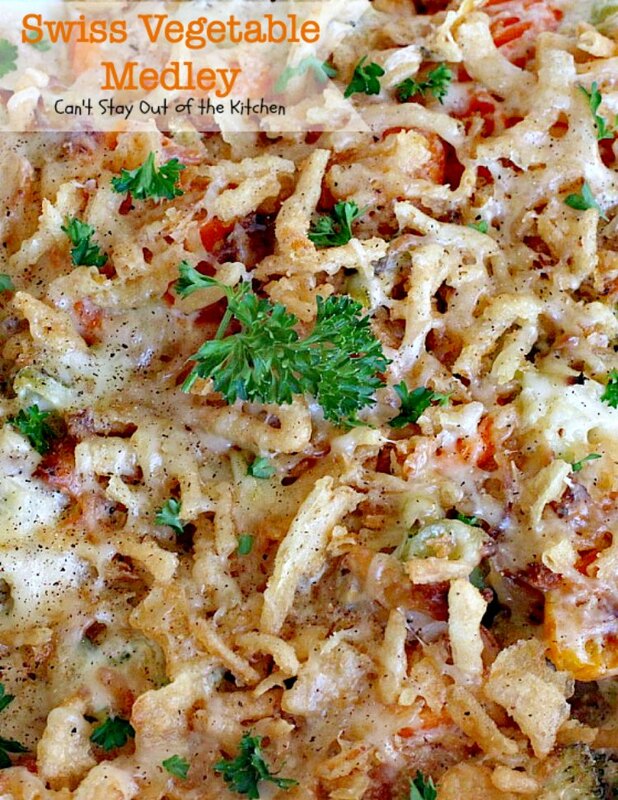 I also used Cheddar Cheese French fried onions because that’s what I had on hand. 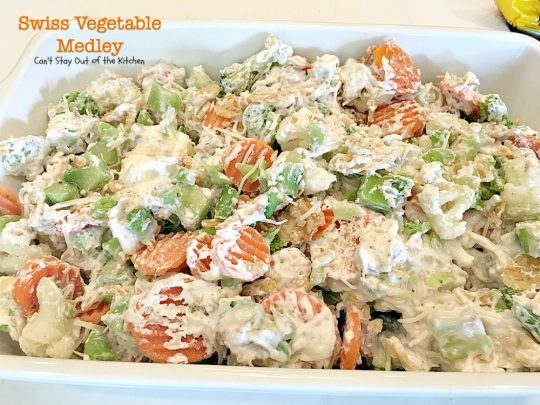 If you’re looking for a tasty side dish as a way to use up lots of garden produce or frozen veggies, this is a great recipe for you! When I initially posted this recipe a week after I started my blog, I was using a simple iPhone 3 for a camera. The pictures were taken at night and they were terrible! I didn’t know anything about food blogging then, but I had such a love for cooking that I wanted to share my recipes with others. Swiss Vegetable Medley is a great side dish for the holidays. Here’s a photo of an individual serving. I used twice as many vegetables as the recipe called for and you can see it was still gooey enough inside. I find the recipe too soupy and the Swiss cheese overpowering if I use the recipe exactly as written. I think this is a needed improvement. The crunchy, oniony flavor from the French Fried Onions makes Swiss Vegetable Medley heavenly! I used these ingredients. I used two bags of this mix, but usually I use two completely different vegetable medleys rather than two of the same kind. 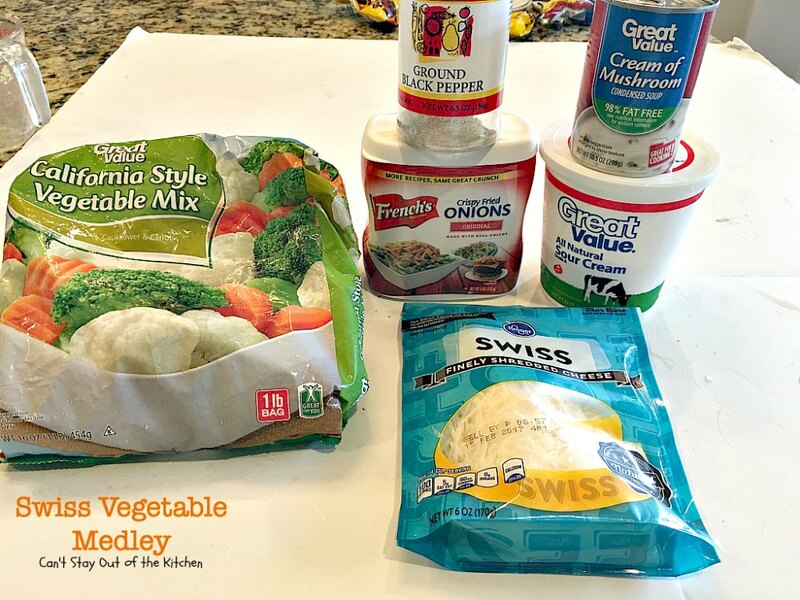 Place frozen veggies in a large mixing bowl. Add cream of mushroom soup, sour cream, 3/4 cup Swiss cheese and 2/3 of the container of French fried onions. Add pepper, to taste. Spray a glass casserole dish with cooking spray. 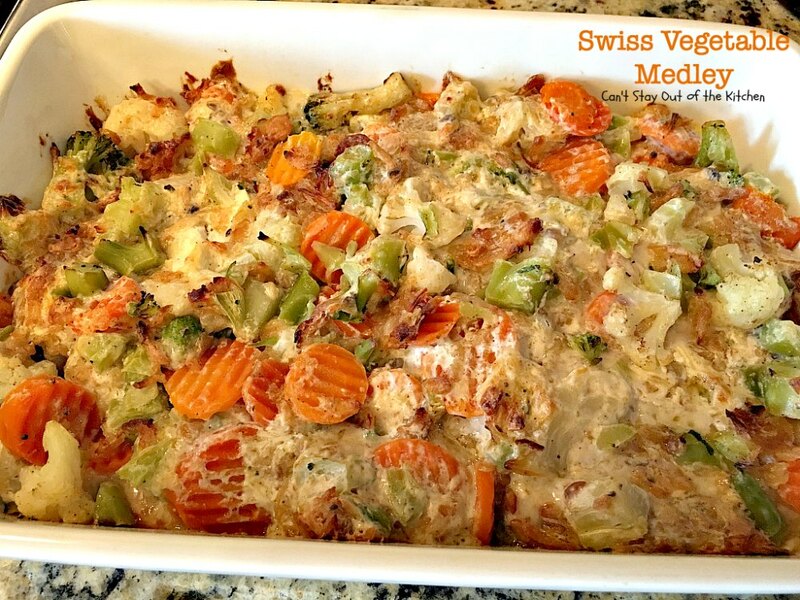 Place Swiss vegetable mixture into casserole dish. Add remaining 1/4 cup of Swiss cheese and then the remaining 1/3 container of French fried onions and brown for about 5-10 minutes in oven. This is what it looks like when it comes out of the oven. 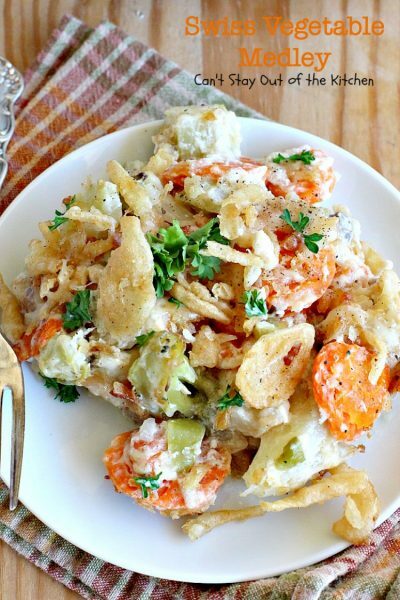 Broccoli, cauliflower and carrots is a great vegetable medley to use in this casserole. 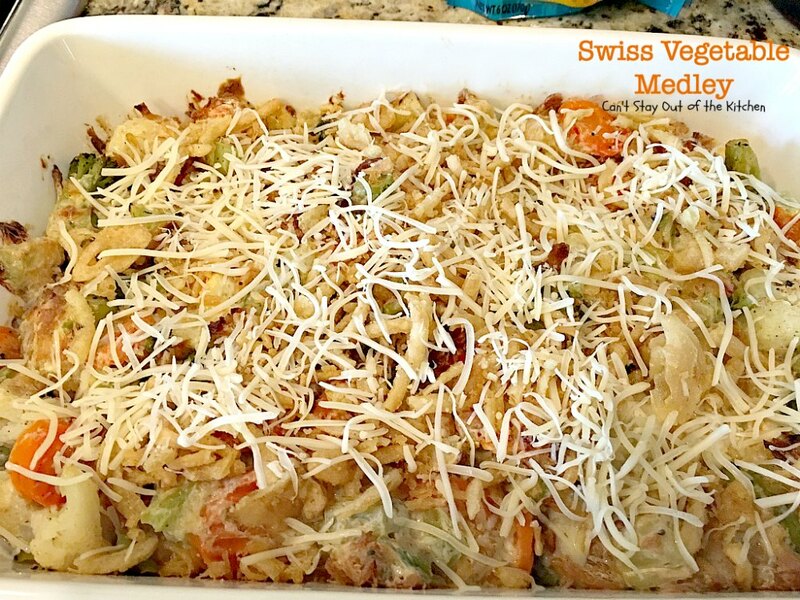 Swiss cheese and cream of mushroom soup make this casserole nice and creamy. 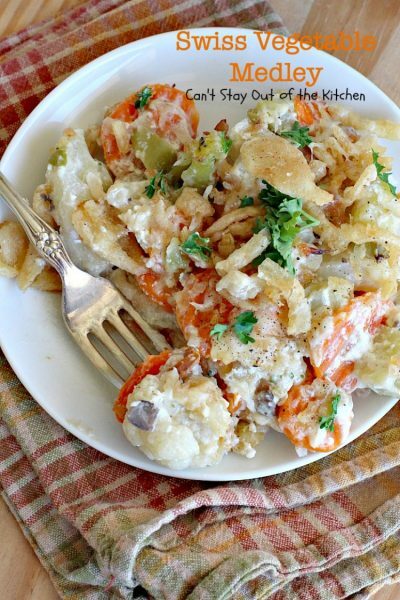 This tasty side dish makes a great holiday side dish. 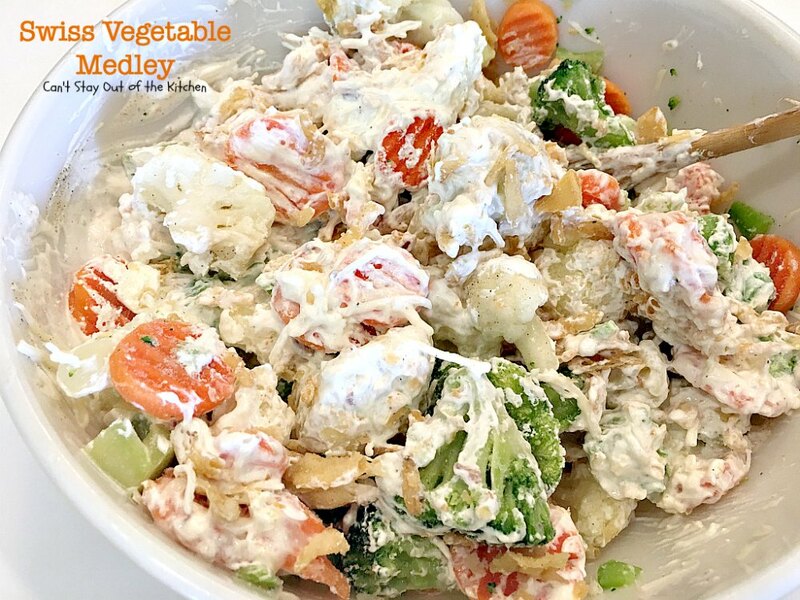 You can use any kind of mixed vegetable medley. The mushroom soup, swiss cheese, sour cream and French fried onions provide wonderful flavor and texture. Set aside ¼ cup of cheese, and 1/3 container of onions. In a medium-size mixing bowl, combine thawed vegetables, mushroom soup, ¾ cup Swiss cheese, sour cream, two-thirds container French-fried onions, and pepper. Pour ingredients into a greased 9x13" glass baking dish. 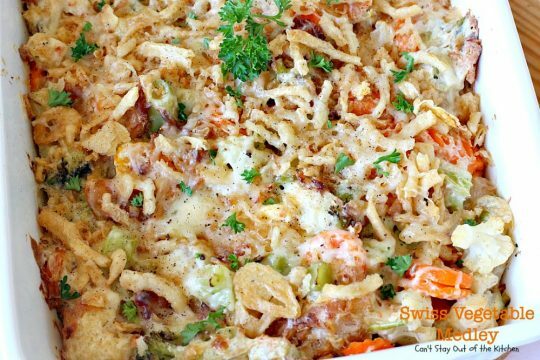 Sprinkle reserved cheese and onions on top of the casserole and bake additional 5 minutes, or until the cheese has melted. NOTE: Other options include a 4-oz. jar chopped pimientos. This tasty side dish makes a great holiday side dish. You can use any kind of mixed vegetable medley. The mushroom soup, swiss cheese, sour cream and [url href=”http://www.frenchs.com/recipe/swiss-vegetable-medley-RE1128-1″ target=”_blank” title=”swiss vegetable medley”]French[/url] fried onions provide wonderful flavor and texture. Set aside ¼ cup of cheese, and ¼ cup of onions. In a medium-size mixing bowl, combine thawed vegetables, mushroom soup, ¾ cup Swiss cheese, sour cream, remaining fried onions, and pepper. Pour ingredients into a greased 2-qt. casserole dish. Other options include a 4-oz. jar chopped pimientos and 24-oz. broccoli, cauliflower & carrots as the vegetable. Swiss Vegetable Medley is a great casserole recipe for holiday baking. It’s really easy and tastes great. Every bite is succulent and amazing. 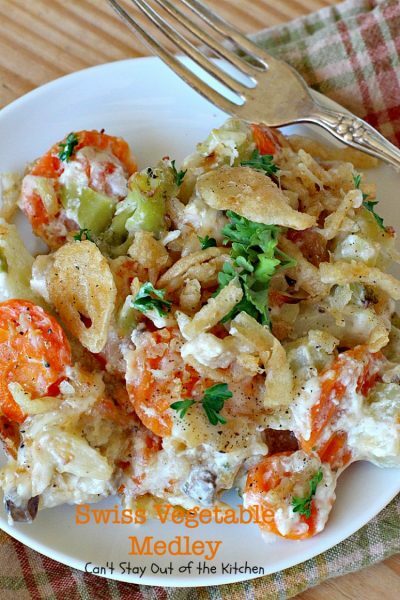 Any kind of frozen veggies will work for this tasty side dish. This one looks REALLY tasty! I’ll try it soon! Thanks for sharing….and the pics are very helpful! I’m glad you find them helpful. 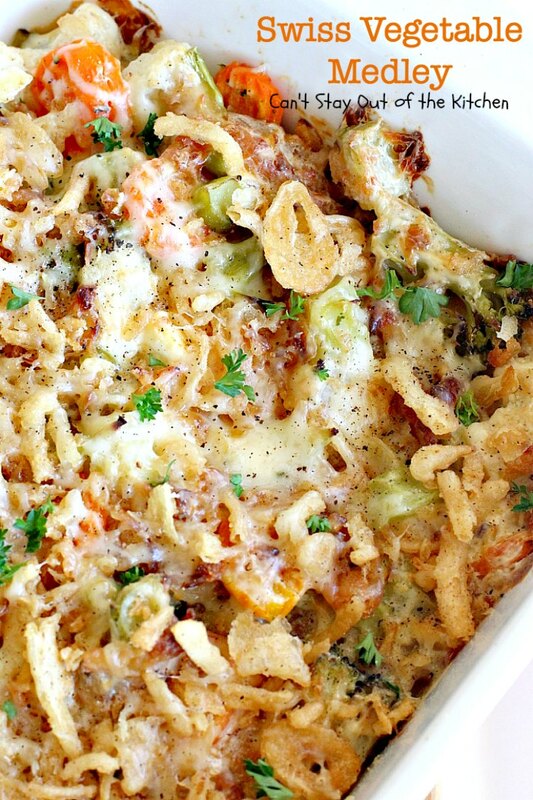 This is a great casserole. I would recommend it for the holidays.